Blended corn tortillas thicken this creamy vegan tortilla soup. It's boldly flavored with cumin, oregano, chipotle powder & a splash of sherry vinegar. I have this tortilla rotation: I buy (or make) fresh tortillas, and I freeze the ones I don’t use within a day or two. I’ll use those frozen tortillas for a while reheated directly on the gas stovetop. But before that batch is gone, I’ll inevitably acquire new ones. Soon enough, I have a random assortment of tortillas filling my freezer, all at various stages of pre-freezer burn. And then I make this vegetarian tortilla soup. There are two types of tortilla soup: the thin brothy kind, which is usually made with chicken, and this creamy style. In the creamy kind, and in this recipe, corn tortillas are cooked into the base of the soup as a thickener. They bring a nice earthy flavor that works especially well with the bold spicy flavors that are in this vegan tortilla soup. Those bold, spicy flavors come from fire-roasted tomatoes, jalapeño, garlic, and onion. I use dried spices to flavor it further, adding oregano, cumin, and chipotle powder to bring real depth to this soup. 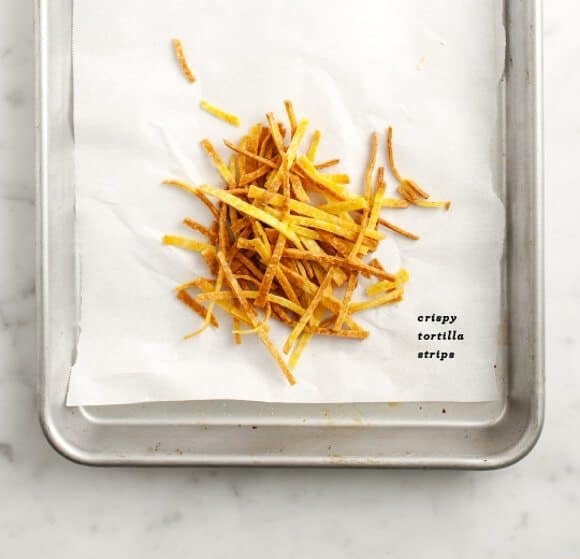 And if you’re not tortilla-d out by now, I suggest topping the soup with crispy tortilla strips and serving it with warm tortillas (fresher ones) on the side. Enjoy! On a large baking sheet, spread out the onion slices, the jalapeno (still whole), garlic cloves and toss with olive oil, salt and pepper. Roast for about 20-30 minutes until the edges of the onions blacken, tossing them about halfway through. Remove the garlic after about 5 minutes, so it doesn’t burn. Remove the jalapeno when the skin is blackened and blistering. Place the roasted jalapeno in a small glass bowl with plastic wrap over it (but not touching it). Let it cool for 15 minutes and carefully peel off the skin and remove the stem and seeds. (use utensils if you can, and don’t touch your eye afterward). 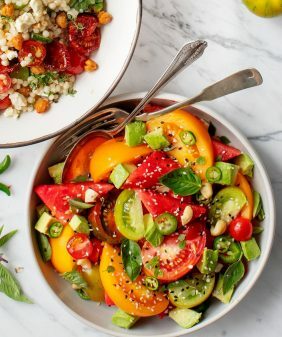 In a medium pot, heat a few tablespoons of olive oil, add the onions, garlic (remove the paper), jalapeno, tomatoes, oregano, cumin, chile powder, a splash of agave or a pinch of sugar, and some salt and pepper. Cook for 4-5 minutes until the tomatoes start to sizzle. Add a splash of sherry vinegar and cook for 30 seconds more. Add the broth and chopped tortilla pieces and let simmer for 20-30 minutes. Remove from heat and let cool slightly. Transfer to a high speed blender and puree. If your soup is too thick, add some water or broth to thin it to your desired consistency. Taste and adjust seasonings, adding in a squeeze of lime. Serve with an extra drizzle of olive oil and the suggested toppings. On using frozen tortillas: If you freeze yours, just let them sit out and thaw before using. 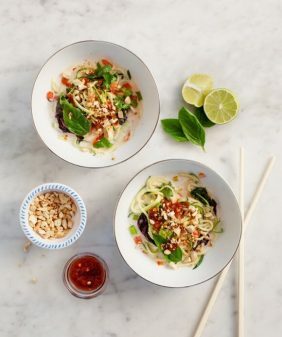 Such a easy but warming dish. I love on southern hemisphere and it is cold out right now. This looks like to could fill and warm up my body this winter with some Mexican spice. Tortilla soup is one of the few meals that I’ve missed since giving up chicken. I love that yours is vegetarian! I’ve never tried a creamy version like this. Sounds perfect. I know, it always bothers me how I can’t order it in restaurants! Just saw this recipe over at Camille Styles. Can’t wait to try it out!! I’m all about soup lately. 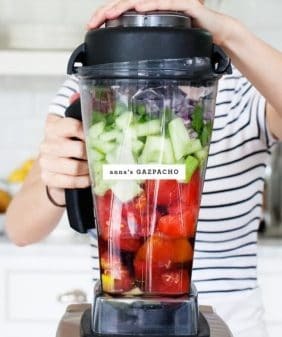 I love that I have all the ingredients on hand, too… hmmmm, I think you know what needs to happen! Love it when that happens, hope you like it! Side note: Why have I never thought to freeze fresh tortillas before? Brilliant. My husband absolutely adores tortilla soup, but I don’t have a really good recipe in my repertoire. I’ll be making this and reporting back. Thanks for the inspiration, Lindsay. Um, I just called you by the wrong name. Apparently I need more coffee. I’m sorry, Jeanine! Ahhh, yes!!! 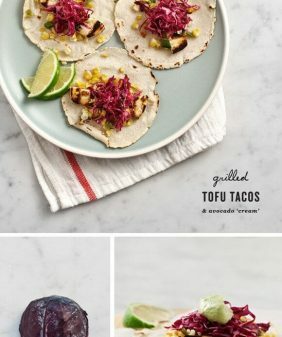 Making this next week and will definitely be utilizing frozen homemade tortillas! 🙂 I have never heard of making tortilla soup with corn tortillas to help thicken. Super cool. This sounds awesome!! Lovely soup! I’m totally part of the creamy soup cam, can’t wait to try this!! Love hearing about your random assortment of frozen tortillas!! It reminds me of my collection of stale bread for soups. This soup is just perfect for all of the random tortillas plus is sounds delicious!! Even though it’s ridiculously (and unusually) hot in SF right now, I could totally use a bowl of this soup! Yum! This looks muy bueno! Ooh, I’ve only ever had the thin brothy kind of tortilla soup before, but this looks so, so good! 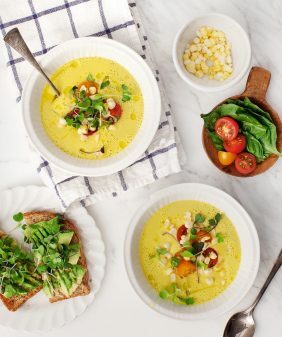 With warmer weather here I’ve been craving salads, salads, salads, but now I have a serious hankering for this soup. A bit of spice would do me good! I LOVE this thicker version! I have never seen one like these. I have to make this. Thank you for sharing! Wow…this is SO gorgeous! Again, what stunning photography! Its sounds seriously delicious too. MUST make! Perfect for Cinco de Mayo weekend! 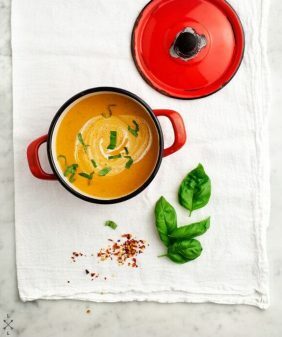 🙂 In fact, I added it not only to our soup Pinterest board, but also to our Cinco de Mayo board: http://pinterest.com/deliciouskarma/cinco-de-mayo. Creating and adding to these boards SO gets me in the spirit. What great ideas and recipes everyone has….so fun! I adore all of your shots, but your soups are always my favorite! You have a way with them that makes them so incredibly appealing! I just made this and it was so fantastic I want to eat the whole pot of it! I love that it’s vegetarian too. I love tortilla soup. I love this creamy version! Thanks for sharing! Anything “creamy” usually works for me but this really makes my mouth watering. I think it’s the combination of spicy and creamy! Delicious recipe! I made it yesterday for cinco de mayo! Added some grilled shrimp, queso fresco & avocado on top for protein & packed it for lunch today. sounds great with grilled shrimp, so glad you liked it! I’ve never thought about freezing tortillas. It is a good idea. Your soups sounds so good. I have the tortilla rotation constantly happening in my refrigerator as well. Somehow they seem to hide in the back so when I get to the grocery store, I can never remember if I have them or not. This is a fantastic way to put them to use though – and the freezing is brilliant – don’t know why I’ve never done that before! Your web site is a wonderful place! I love your kitchen, the white around all, your photos and the light, your recipes… everything! I LOVE creamy tortilla soup and have been searching for a solid recipe. Can’t wait to make this! Made this last night, it was amazing (and easy to make)! Will now be my go-to soup. Thankyou!!!!!!!!!!!! My mother-in-law creates a similar creaminess and tortilla based taste by using about 1/4 cup masa harina (the flour used to make homemade tortillas) mixed with some water and then stirred into soup and simmered. It kind of works like corn starch, but more grainy like the tortillas. This method can be used in all types of soup when the earthy corn flavor matches the ingredients. i.e. squash soups. Oh, I will have to make this for my husband. He loves tortilla soup! Thanks for sharing. Your photos are simple lovely, as always! Just made this soup tonight and it’s delicious! First time making homemade tortillas too…not sure what took me so long. Great recipe! Can you modify this for a slow cooker? Hi Sabrina, I’m not sure, I’ve never really cooked with slow cookers so I’m not sure what changes to suggest, sorry! Just curious if you could/should/shouldn’t add beans to this recipe? There are so many variations online and another creamy recipe I found has refried beans, black beans and corn whereas this one only has tomatoes and tortillas! What do you think? Good/bad idea? This was phenomenal, just the right amount of spicy! I had never made anything like this before, but this recipe came out amazing! I added about half a can of chickpeas in with the tomatoes to add a little extra protein so I could have it as an entree instead of a side soup – highly recommend it! I have been browsing your site for 10 minutes and have already fallen in love! I’m so excited to try this and so many of the other soup recipes you have!! I would love to try this recipe of yours, however I got stuck with one item. What is that jalapeno, and how it looks like? it’s a small spicy pepper, you can skip it if you want! Wow this was great! Just the right amount of heat. I added 5 tortillas and it was really creamy. Hi Grey – I’m so glad you enjoyed it! I’m wanting to make this in the crockpot and I’m terrible at converting recipes. Any suggestions? 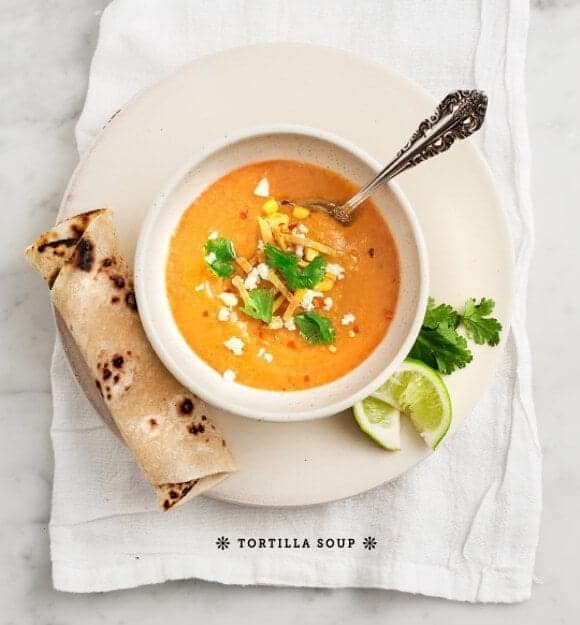 Either way, we will be trying this- I have been dreaming of a creamy vegan tortilla soup for YEARS! Thank you so much!!!! We had a smooth thick tortilla soup at an upscale Mexican restaurant & really loved it! Hope this recipe is similar. The tortillas blended in was the difference. A different flavor….delicious!